Once the countdown to spring break has hit zero, the next countdown – to standardized testing – begins. 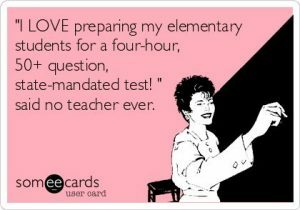 I don’t think I’ve ever met a teacher who enjoyed preparing students for testing. It is no small feat to review an entire year worth of curriculum while maintaining student interest, especially if they are preparing for reading, math, and science tests! You have probably put aside (hoarded?) paper all year just so you could copy those review packets. Just as the weather warms up and students want to run and play, we make them sit and rehash what they’ve learned. It’s tedious, it’s boring and, dare I say it? It’s ineffective. Even if you’re lucky enough to avoid the multiple choice packets, your students can only sit through so many Jeopardy games, vocabulary reviews, or testing review websites before losing interest. Instead of closing our doors and buckling down to choose A, B, C, or D, let’s collaborate! Gather your best teaching partners and your best ideas. Divide and conquer the curriculum! Make your science review into a Day of Science, and move students from station to station. Each teacher plans one or two stations, bringing their best materials and ideas to the day. Your students will love moving from room to room and topic to topic. They will think they’re getting a fun day, but really, they’re learning! School A is the HOST school. Schools B & C bus their students over for the canyon or earth sessions. Let’s suppose there are six classes at each school. 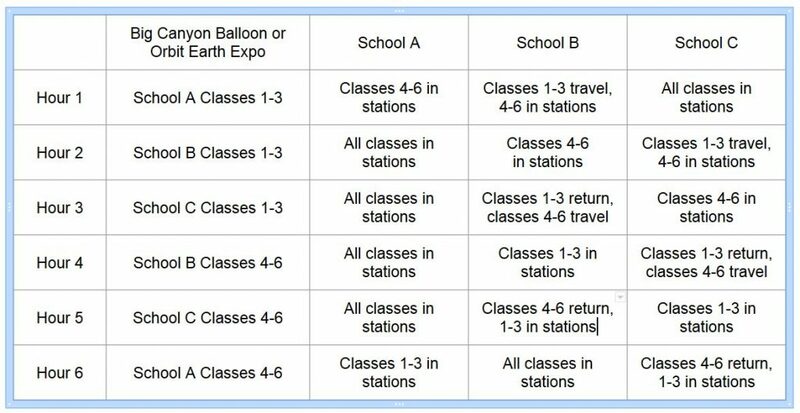 The number of sessions and session lengths can be adjusted for schools B & C, based on travel time. Of course, this is just ONE possibility. Take a look at the standards that we cover and contact us to plan your own Day of Science!